The annual Biotech Showcase at JP Morgan in San Francisco proved to be a very informative interaction with Ariel Katz. The company H1 is a live data insights platform for disease by using machine learning based in New York City. The company announced a $6MM funding round led by Shore Group last October. The company has three different platforms based upon three different domains: H1 Ada, H1 Curie, and H1 DaVinci. Katz co-founded H1 in 2017 based on the premise that universities generally don’t know what every investigator is doing, institution’s generally don’t know in toto what their employees are doing, and overall no one has any idea what is going on regards to the research in the broad overview. He created similar technology to his first company in 2014, rebuilt it all, and was determined to take it to the industry space. The universities pay H1 a license to use the platform, such as Thomas Reuters, to keep track on what they are publishing, what conferences they are speaking at, benchmarking their peers. This helps universities measure performance, such as how is Hopkins doing against Cal Tech, how MIT is doing against Harvard,. Katz started working with pharma, biotech, medical device companies and consultancies to help him identify research throughout America. He aggregated all publicly available forms of research and scholarship by investigating university websites, web pages, sources from Pub Med and the USPTO (United States Patent and Trademark Office). As a result, Katz structured data of about 2 Billion different documents. His staff are comprised of engineers, data scientists, data engineers, hospitals, health systems, researchers, all whom build a taxonomy of all of the research out there, mine individual publications, webpages, and all of their basic information, and then combining all of the repositories of scholarship. The three main components of H1’s service bundles to help scientists to make smarter scientific decisions by providing access to critical data through an intuitive interface. H1 Ada data point is on scholarship in America. That is their baseline product. H1 Curie identifies KOL’s (Key Opinion Leaders) – top scientists in each therapeutic area, identifying top scientists around this given protein or gene, etc. 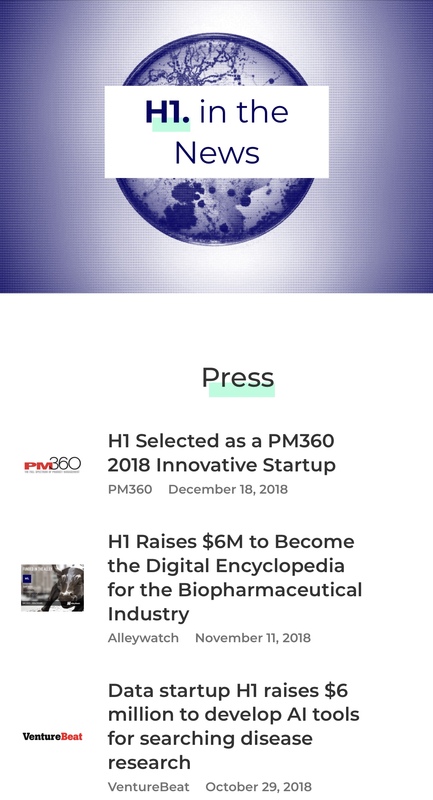 H1 Da Vinci profiles companies and all scientific research that that company is doing and how they stand in that scientific research against their peers. When looking down the road strategically, Katz says, there is a huge market opportunity on the bench side of things – pharma/biotech/CRO/financial services associated companies in that ecosystem. He encourages further inquiries from the Hopkins medical community to join their initiative since they are actively hiring. Check their website. © 2019 Hopkins Biotech Network.